The struggle to lose extra weight and to stay fit is always a huge hurdle. There are so many techniques and methods we try to follow to achieve our dream body. Well, out of all the trending and internet storming ways, smoothies are a great way to detox and fulfill your cravings at the same time. 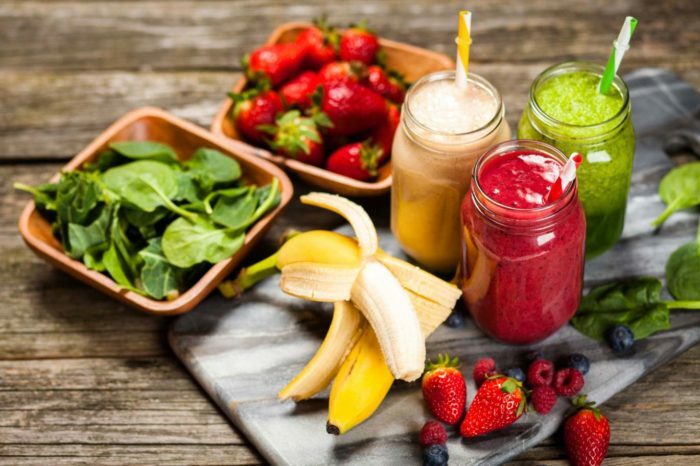 These delicious smoothies work great when you put in the right amount of ingredients in the correct quantity giving you a tasty, low calorie and high protein content drink. Just like how you would need a good long weekend’s break after a chaotic schedule at your workplace, the same way your body needs a quick getaway cleansing to get rid of the stress. You can easily make these health-boosting, mouth-watering smoothies for your breakfast or as a post-workout drink to help you feel energized and active all day. Flaxseeds or linseeds are the highest source of omega-3 fatty acids, micronutrients and fibre. It helps in improving digestion , reducing the risk of breast cancer and cardiovascular diseases. Fill up your glass with the goodness of banana , orange juice and blueberries. Blueberries are known to reduce heart complications and promotes wound healing with its high amount of Vitamin C.
A refreshing light drink packed with tropical citrus flavors of pineapple and orange along with fresh ginger gives you a boost of Vitamin C perfect to build immunity and a high fibre content. This smoothie contains lots of benefits for your heart and skin preventing various further complications. The name says it all. This smoothie deals with a handful of baby kale and coconut water is a trending health detox drink which you ought to try. Kale has a lot of nutrition loaded in it and is considered one of the healthiest vegetables. It is good for the bones, heart and also reduces the risk of cancer as well as asthma. The smoothie absolutely defines healthiness; a perfect drink for health aficionados! Mango smoothies have always been on the detox list to flush out the toxins and maintain optimal health. A little twist of lime and cilantro is great way to cleanse yourself and facilitates weight loss. It is high source of antioxidants and fibre boosting immunity and prevents cancer. Bananas for its deliciousness and oats, well for the rich fibre content offers us many nutrients such as omega-3 fatty acids, vitamin C and K. The Oatmeal-banana smoothie pumps you with energy and is a salubrious drink for a great head start to your day. You can also add more fruits for flavor according to your personal choice such as strawberries or peaches. As sinful it may sound, it is indeed one drink that you certainly are going to enjoy. Days when the sweet tooth just can’t take it anymore, treat yourself with this mouth-watering drink with contains cocoa powder or dark chocolate and raspberries. Antioxidants are present in abundance in dark chocolate which increases the blood flow to the brain. Raspberries are loaded with anti-cancer and anti-inflammatory agents giving your body a berry healthy rejuvenation.